After weeks of preparation, the timbers for the lower rear porch are in place! They were planed and carefully numbered, measured and notched independently over on the garage slab. When assembly began, it went together quickly in only two days. We were still down in Louisiana, so didn't see the actual work in progress. as well as the area where we expect to spend a lot of time! The posts are 12x12 so massive is a word that definitely applies. We've got to hand it to our architect, since we'd never have thought to go with such large dimensions on the lumber. Hoorah! It's becoming less of a plain "box". Last week we got to see another of the architectural details of the house! The tapered columns on the front of the house! They'll be covered in ledgestone veneer so their scale looks a little narrow as they are now. 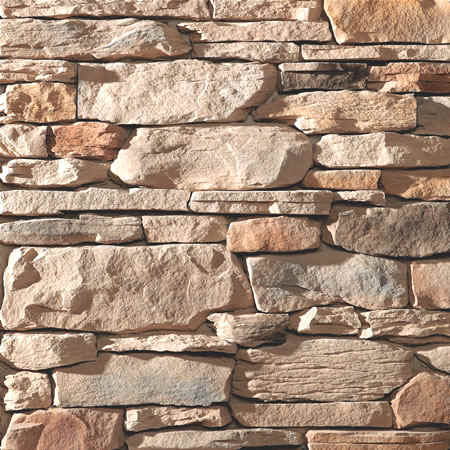 We're using Dutch Stone in the Natural Blend color. Dutch Stone will also be used on the lower portion of the house where you see black paper and below. Two columns stand alone on the front porch and a third wraps along the corner to the right of the front door. Tim was laid to rest in a tree shaded cemetery in Shreveport where several generations of his family are already interred. Friends and family gathered to say goodbye to a man that we all loved and admired. Ada was the rock that I knew she would be for the services, but we all knew how her heart was broken and aching. Dinner the evening after the funeral seemed incomplete without Tim there to tell stories; he'd have loved the sight of all 25 of us seated at the long table. Some of the group were relatives and others were "just" friends, but we were all bound together by the common thread of having known and loved J. Timothy White III. Does it seem strange that we brought the dogs along with us on our marathon drive back to Louisiana? Tim was a dog lover (is there such a thing as a horse person who isn't a dog lover?) and Mr. Biggs loved to sit on his lap and be stroked. After getting to know Biggs, Tim caught the Jack Russell bug and came home from a trip to Oklahoma with a JRT puppy "Jack" who soon became the apple of his eye. Biggs had another seizure last week (his second this month) so we weren't willing to leave him behind. No doubt, Tim would have approved and understood. And since Mr. Biggs was coming, there was no reason not to bring Atta who helps Biggs feel more secure when in a strange place alone. The Residence Inn was pet friendly and the weather was mild enough that they could even stay in the car without being too cold. Too soon it was time to leave and we said goodbye with promises of future visits, texts and phone calls. Should the retirement gig not pan out, Joe and I may have a career as long haul truckers: seventeen hours and 1,100 miles after leaving north Louisiana, we pulled into our driveway in VA at 1AM. Thanks to everyone who sent a note or comment this week, I'll get caught up one of these days! One of our dearest friends from Louisiana, Tim White passed away this weekend and we are heading to his funeral. I can't believe that I've just typed those words. I took this photo in mid August, the morning after their 50th wedding anniversary party. Does this look like a man who has a hidden liver cancer that will claim his life within just a few weeks of being discovered? I'm in denial and I know that I'll be snatched into reality when we get to Louisiana. If it's unreal to me, I can't imagine being in Ada's shoes right now. I can't find the words to write a long tribute because nothing seems sufficient. Yesterday, I thought about pre-writing a few posts that I could publish from the road this week. I wasn't going to mention Tim's death or his funeral until after it was all over and a little less raw. I was just going to do a few catch up posts about the house, the horses, or the myriad of Christmas events that we've been attending lately. There are bloggers who write bits of generic prose every single day and adhere to the mantra of "Stay Away from Personal Subjects." If their blogs were books, they'd be "coffee table" books. Gorgeous to look at, but they purposely don't tell a story. I'm not an advice giver, a photography site, or a money driven blogger. In my own haphazard and scattered way, I'm just trying to remember what's been happening in my life. Sometime I wish that I was a generic blogger because I'd rather pretend that this hadn't happened. What More Can We Fit Into One Day? We've been perfecting the art of leisurely drinking coffee in bed, but Friday we were up and out of the house early. First a quick stop at Pure Eats for freshly made doughnuts. Dare I say that they're better than Krispy Kreme? I'm a cake doughnut convert now! They're light and fluffy with crazy gourmet flavors like Margarita (lime and a little salt on top) in addition to the traditional Cinnamon, Maple, Chocolate etc. Pure Eats is in a former gas station/garage and serves the odd combination of doughnuts early in the AM and then at lunchtime hamburgers made from local beef, fries and milkshakes. Other than coffee and soda, that's the whole menu; they're taking specialization to an art form. All the interesting character of the building is still intact. Next stop was the house site for 8AM to meet the central vac installer. We needed to go over his final price and talk about locations for the outlets. The central vac was perhaps one of the best things that we splurged on at the old house. We learned today that he can't get the Beam brand unit that I'd prefer to have and so I'm back in the hunt for another installer. Beams and posts of another kind were being moved around at the house site that morning. The prep work for the timber framing of the rear porch is still underway. We had hoped that it might have begun to take shape late this week, but things have been delayed a bit and we'll have to wait until next week. As soon as we could shake free from the house site, we rushed off to the barn where we hooked up the trailer, loaded the horses and met Barb at the Hardees parking lot in Buena Vista. She'd gotten an invitation extended for Joe and I to come along and ride on a 7,000 acre tract of private property bordering the Blue Ridge Parkway. Seven thousand acres! Can you imagine? Lauren who is caretaker of the property was kind enough to take a chance on letting us come along. We tried hard not to make total idiots of ourselves so that we'd be invited back! The four of us wound around on trails and old logging roads and had another perfect day with sunny blue skies and fine well behaved horses! Little Miss Cloud continues to amaze me with her calm demeanor and willingness. Her gaits are becoming more "set" and she's just a joy to ride. No Carol and Bryce.... you can't have her back! It was a hard ride for Sarge. Lots of steep grades and he's usually carrying the heaviest load; plus he's still not really in shape for the mountains so we had to stop a few times and let him take a breather. Actually it was a hard ride for all four of us.... we only went 8.5 miles total, but there was a lot of climbing. We were pleasantly tired by the end of the afternoon but we had more to do! It was a rush to get back to the barn to drop off the horses, gear and trailer; scoot home to let the dogs out and reassure them that we hadn't deserted them; and then straight back into Lexington to meet Barb and Rich for pasta and a salad at Salerno's. With full stomachs, we strolled across the parking lot to watch the Christmas Parade!!! The Grinch was a big hit as he spun and danced, taunted the crowd, from about 12 feet up in the air. Old cars, marching bands, local beauty queens, cheerleaders and politicians. That's all similar to what I'm used to but what's the difference between a Louisiana parade and a Virginia parade? My favorite group was the VMI marching unit which was followed by their bagpipe group! Awesome! What's the same in Virginia as in Louisiana? The last float of the parade: Santa, of course! It was another exhausting busy day where we accomplished nothing other than enjoying ourselves. We're getting pretty good at it! We went on this ride over a week ago, but I let it slip through the cracks. Time to post about it though so I don't forget where we've been! Barb and her husband Rich were nice enough to invite us to their home for dinner despite the fact that they barely knew us! It's gestures of kindness like that which help us feel that we'll eventually fit in and have a circle of friends nearby. Apparently we didn't embarrass ourselves too badly at dinner since Barb suggested that we meet for a ride the next morning in the George Washington National Forest's Irish Creek area! Irish Creek is named for .... you guessed it, the Irish who settled in the valley during the mid 1700's. It's a narrow deep valley with mountains coming down on each side of a small strip of land which ends at the Blue Ridge Parkway. We drove out SR603 and parked at the Irish Creek Cemetery on Irish Creek Road which was alongside Irish Creek..... are you seeing a pattern to the names here?! It was rifle season for deer; however, since VA has a No Sunday Hunting law, we were fairly safe but we wore our orange vests just in case. Barb rode her handsome black Rocky Mountain Horse and our three gaited horses kept up a nice pace together. The unmarked trailhead was beside the cemetery and it began by going uphill alongside Big Bend Creek. Will we ever get used to seeing clear bubbling streams, boulders and mountains?! I hope not! After about 2 miles of riding a slight uphill grade through the woods and following the creek upstream, we leveled out at the top where the views opened up around us. After posing for a few photos, we made a loop via some National Forest roads and headed back down to the trailers for a total ride mileage of about 6.5 miles. The trail was wide with great footing for the horses, easy stream crossings and a gentle grade for climb. The views were nice in the winter and I'd imagine that the shade and water access would make it a pleasant trail in the summer. We'll be riding this one again! This post falls in the category of interesting and odd things that people think of to do in our new home county. I'd been seeing a blurb in the local paper's Things to Do listing for "The Horses' Christmas" being held at a small elementary school over on the eastern side of the county. I wasn't planning on going since I hadn't a clue what it was all about. But the night before I learned that a few of the new riding friends that I've made here were involved. I arrived to find about 15 horses and mules standing patiently along the school fence and getting prepped for the occasion. When it was time for the show, the entire elementary school came out and made a circle out on the lawn while the horses paraded around a central Christmas tree. Ooohhs and ahhhs from most of the kids; plus a lot of squealing and nose-holding when manure would make it's inevitable appearance! Though Rockbridge County is rural, horses were a big hit with the kids and many seemed in total awe. The star of the afternoon was Santa who appeared riding a handsome black Walking Horse! The Christmas tree in the middle of the lawn was decorated especially for the horses and after the show was over, they all tucked into the apples and carrots. So that was "The Horses' Christmas" out at Enderly Heights Elementary School. Pretty unusual wasn't it? It's a crazy fun place to live! What color is a Caribou anyway? I've got colors.... or at least color choices!! and tapered stone columns on the front of the house. Our old house was traditional farmhouse gray with white trim and windows but this house will be "earthy" tones: muted and trying to blend in a bit with the hillside. The exterior cladding of the Loewen windows and doors is called Tuscany Brown, which is a misnomer since it looks like a graphite color with only the merely the barest hint of brown. I've decided to play off the dark windows and accent them by staining the window/door trim, rafter tails, fascia board and timber frame posts and beams a darker shade than the base color of the house. Those trim elements and the timbers will be Sherwin Williams Caribou which is a dark taupey graphite color. Is that what a Caribou looks like? The bulk of the house where it isn't ledge stone will be board and batten Hardiboard painted in a creamy tan appropriately named Sand Castle. It seemed a little pale so I'll be having it made to 125% strength. Still to be decided is the color of the porch ceilings and soffits which I'm planning on doing a sagey gray. 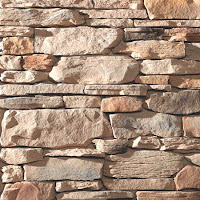 Our ledge stone samples didn't come in today as planned so I'll have to wait until tomorrow to be sure that it all blends with the stone choice. In the meantime here are the final color choices that I put on a few scrap boards using Sherwin Williams samples in paint formulation (they won't do samples as stains). First photos taken in the sun. The same colors when seen in the shade. The top wedge shaped board is SandCastle in the normal strength. The bottom rectangular board is the 125%. It's a very slight difference. I wish the colors were "prettier" but I'm fairly confident that it needs to be a more "organic" looking house. We spent a little time this AM talking to Bob who is directing the timber frame porch building. He has been notching and sorting for the past few days. We're lucky to have him helping with the project; he's a talented craftsman! Going riding tomorrow to blow the cobwebs out of my brain! Update: If anyone is reading this and looking for paint colors you should know that I decided against Caribou and used a different color "Shagbark"... see the post in January: "A Woman's Prerogative" Caribou just didn't cut it!! Thanksgiving gave me a much needed break from my computer and the house. I've been practically paralyzed with indecision this week and feeling a bit jittery about some choices that need to be made at the new house. My mind is bouncing around like a pinball. Where to go darker, where to go lighter? What to tie in with what? It's a beautiful house and I don't want to mess it up!!!! We'll be living with these color choices for a long time; it's not like I can decide one morning to buy a few gallons of paint and do a little redecorating. The crew wants to put a coat of stain on the posts and rafters before building the timber-framed porch that will span the back of the house. Friday is my deadline for giving them the stain! We've been having some vibrant sunsets throwing color on the walls and on the timbers as they lay on the ground. Pinks and hot oranges aren't typical Craftsman/Prairie colors, so I'll have to look elsewhere for inspiration. This is the time that I wish I had "people" who would make these decisions for me. Let's get real, I couldn't let anyone make all those decisions for me! I'd still be calling the shots but a little advice would be nice. The guy at the Sherwin Williams store is helpful in a maddeningly uncommitted way; I think he's had many years of learning to smile and let the customer always be right. I say one thing and he seems to agree. I change my mind and he nods and agrees again. He must be a great husband to someone! I'll post some photos of the final selections tomorrow! I never wished anyone here in blogland a Happy Thanksgiving, so I'll jump right into the current season and wish you all a Happy Advent! We still haven't celebrated our first Thanksgiving in Virginia since we drove to Tennessee last week in order to be with family. Mr. Biggs came along since he's too difficult to leave behind now that he's getting more and more "tottery" in his old age. Our helpful neighbor Sharon offered to take care of Atta and Noel even though she had family coming over for the holiday..... talk about nice! When we drove away from Rockbridge County in the AM on Wednesday, it was one of the most glorious days that we'd seen this fall. The leaves are off all of the hardwoods, but the day was so clear and bright that each branch of the trees on the mountainsides was sharply distinct. We saw hilltops beyond hilltops that we had never noticed before and houses nestled in the woods that were previously obscured by foliage. When we neared the VA/TN border, it got a little drizzly and then ..... a rainbow! I was driving but Joe took a few snapshots through the car window. Stretching across much of the sky, it had the shadow of a second arc next to it and we could clearly see each of the seven color bands; it was as if VA was wishing us goodbye! The four sons were scattered across the country for the holiday, each of them spending the day with friends in their respective home states, so we didn't see any of them. But Tennessee is home to my sister and brother-in-law, my nephew and his wife (is she my niece-in-law?... that doesn't sound right? ), and my adorable great-niece and great-nephew. The torch of hosting Thanksgiving dinner was passed to the younger generation and though hampered by having only one oven which was just big enough to hold the turkey and no side dishes, they did a great job! We were full and just a little uncomfortable from making room for a little more of everything on our plates! A cautionary word of advice for anyone else with one oven: If you are tempted to fire up the outdoor BBQ/smoker in order to cook and heat side dishes, DON'T! Proof that we aren't as intelligent as I'd like to think is the fact that not a single one of the seven adults present thought of taking the turkey out of the oven and putting it in the smoker instead of the towering stack of casseroles which my nephew had balanced above the charcoal. This oh-so-obvious solution was suggested by a neighbor here in VA after we were telling him the tale of the burnt green beans! It was my first time to meet my "new" great nephew (he's almost 20 months old!) and I hadn't seen his sister since she was a baby, so the feast was secondary to spending the day with family and getting to know the kids. Having folks descend on your house when you are the parents of toddlers and preschoolers isn't easy, and they probably collapsed in bed for days after we left! We returned to VA on Friday in time to take part in the community tree lighting and caroling down Main Street. When darkness fell, we lit candles and walked through downtown behind Santa and Mrs. Claus who were riding in a carriage pulled by two beautiful white horses with sleigh bells jingling. The caroling was a little haphazard as the crowd of 400 was spread out so far from front to back, but the glow of candlelight illuminated smiles all around and the crisp weather made for a fine evening. Farewell to Thanksgiving and let the Advent preparations for Christmas begin! When Deb whom we first met last weekend mentioned that she would be using her mules in a few days and that we were welcome to ride along, you know that I jumped on the invitation! I didn't know where we were going or whether the ride would be strenuous or easy, but I immediately said "Yes! We'll be there!" Who can pass up the chance to make new friends, ride new trails or see mules in action? Friday AM dawned clear and thankfully not windy. Though the temperature was in the high 20's it felt brisk but not uncomfortable. We were going to the Rich Hole Wilderness about 15 miles west of town; Deb had been asked by a group of hunters to pack in their supplies for a week in the woods (rifle season for deer opens Monday). Named for the rich soil that is found in the coves or "holes" in the area, Rich Hole Wilderness consists of 6,450 acres set aside as wilderness area by Congress in 1988 and administered by the US Forest Service. In the 1800's the area had an iron-producing furnace (Longdale Furnace) which employed thousands. The mine and furnaces closed in 1911 and 20,000 acres were eventually "given" to the Federal Government after the death of the heirless owner of the Longdale Furnace area. Between the mining and associated logging operations, only the highest and steepest parts of the mountain were untouched, but nature has since had almost 100 years to reclaim the Rich Hole Wilderness Area. Once the four mules were loaded and the seven saddle horses mounted, we were finally ready to start. It takes a quite a while to get so many saddles, bridles, packs and riders organized! We crossed the road from our parking area and followed at first alongside the clear waters of Simpsons Creek before turning and beginning up the western side of Brushy Mountain. With 11 equines crunching through the leaves and me chattering to new friends Barb and Wendy for most of the ride, we didn't see any signs of wildlife along the way! We were surrounded by mature hardwoods, but all of the leaves were down so I couldn't tell a poplar from an oak or sugar maple. The ferns and mosses in sheltered areas were the only bits of green to be seen.... winter has arrived on the higher elevations! In spite of one stretch where we climbed almost 1,000 feet in just over a mile, the ascent seemed fairly gradual for the entire 4 mile trip up the mountain. The trail was wide and well banked with no erosion, plus the well placed switchbacks kept the horses from needing to work too hard. Despite the good footing, you never know what will go wrong when you're dealing with animals. We were almost to the top when the mule carrying the largest load shied after his load shifted. He stepped off the trail, immediately was caught by gravity, and went sliding down the side of the mountain! He didn't go far before being stopped by a tree. He lay quietly and remained steady while Deb, Forrest, Wendy and Lisa cut the packs free. Aside from a scrape on his nose, he was fine and was able to scramble and lurch back up to the trail. It could have been MUCH worse! When we reached the top, we had ascended from our start of 1,500 feet to 3,500 feet. Cloud isn't ready for the Himalayas, but it was an accomplishment for us flatlanders! A massive canvas tent complete with wood stove had been packed in the week before, so roughing it was a relative term for these hunters. We ate a hurried lunch from our saddlebags while sitting on a rock at the crest of the mountain and then it was time to retrace our steps before the early sunset of daylight savings caught us out after dark. We settled our pair of tired horses in their stalls at the boarding stable, unloaded our gear, unhooked the trailer, drove back home and fell into bed (after taking some Aleve! ); it had been a long day.... but one to remember!